"Your android replica is acting up again. That's no joke. When she comes she moans another's name." The tune "Spirit of the Age" from the Hawkwind album Quark, Strangeness and Charm is linear in its original form. That made its charm. To underline even stronger this linearity may very well be overdoing it. Out of the four remixes found on this EP, one can sustain interest. The first, the "Radio Edit," has full throttle drum machine thumps. So much for that. The next one, the "Full Vocal Mix," still has those drums. That's disco-dance stuff anyhow, so what does it do in the prog section? I was asking myself. I've heard much more interesting dance music, Rough Trade and Martha & the Muffins for instance. Uh-uh. So let's move on to the "Cyber Trance Mix." Starts with vocoded voice, a sample from the original vocals that repeats: "an android." At least that's appropriate. Would sound good in a Red Dwarf episode. Synth filter sweeps. Oh, here comes the drums. No vocals in this one, only the same vocoded voice. The 'trance' aspect of this mix can make it interesting. And now the "Flesh to Phantasy Ambient Mix", which is the better track. Some Gong-like synth over a spatial synth pad. More filter sweeps. The drums are softer. This is an inspired mix, perhaps in the same vein as The Cure re-mixes: they propose interesting variations inside the rather straightjacketed 'mix' style. 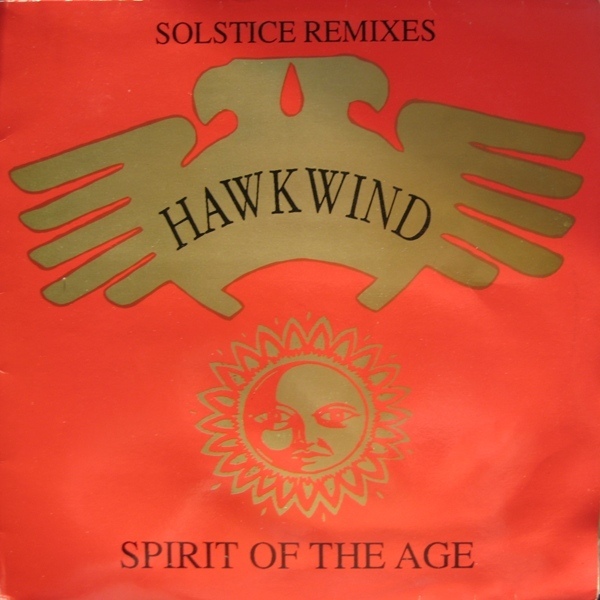 If you're an Hawkwind fan and if you happen to run into this "Solstice Remixes," you may want to take a listen. If only for the last track, clocking at 12:05.